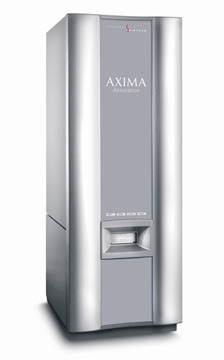 The AximaAssurance™ is designed with the general analytical and life science laboratory in mind. Incorporatinga variable repetition rate 50Hz N2 laser, the system provides high quality rapid MALDI mass spectra and an array of software tools for data processing and reporting. Positive and negative ion modes are included as standard, allowing greater flexibility and extending the compound categories that may be analyzed. A patented beam blanker optionally removes unwanted low mass ions and prevents detector saturation. High sensitivity is achieved using near-axis laser irradiation and advanced ion optics for enhanced ion transmission. Pulsed extraction of ions from the MALDI source improves resolution and enhanced calibration algorithms with easy to use software provide more accurate data. Application-centric data processing software packages - PolymerAnalysis™, OligoAnalysisTM, provide solutions to many common analysis requirements. The AximaAssurance™ provides an ideal platform for biomarker discovery through rapid screening of protein/peptide biomarkers, drugs and metabolites from tissue sections followed by mapping their locations using integrated software tools.